Faro Airport is the Algarve's only international airport, dealing with mainly short haul flights from a wide variety of European destinations but there are several Faro flights and departures daily. It is about 4kms from the centre of Faro and it is a relatively straightforward drive from the airport to the A22 - the main motorway that runs from the Spanish border, in the east, to Lagos in the west, making for speedy transfer times from the airport to resort (nowhere in the Algarve is more than 1 hour 30 minutes transfer and all of the popular tourist resorts are reached easily within the hour). Faro airport has one terminal building with departures and arrivals at ground level along with all the usual facilities you would expect to find such as restaurant, cafes, shops, pharmacy and car hire. There are 62 check-in desks to cope with peak demand in the summer and Faro Airport not only serves the Algarve but also the neighbouring Spanish area of Huelva. For passengers travelling from the UK and Ireland, Portugal is in the same time zone (GMT) with clocks changing on the same weekends in March and October for daylight saving. Address: S.A Aeroporto de Faro, 8006-901. Faro, Portugal. There are several hotels within just a few kilometres of Faro Airport, including the popular 4* Hospedaria Frangaria and 3* Hotel Monaco. There are also hotels a little further from the airport which offer an airport shuttle service. Hire cars that are available at the airport are in P4 car park just across the road from P1 and P3. Avis, Europcar, Goldcar, Guerin and Hertz all have permanent offices at the airport. If you have pre-booked your Faro Airport car hire the car company representative will be waiting in the area just outside the arrivals hall. Some of the companies have the cars at the airport and others will take you the short distance to their depot by bus. There is a petrol station (with a convenience store) at the roundabout to the entrance to the airport. If you book Faro Airport transfers you will be met by a company representative in the arrivals hall and taken personally to the transport. The time it takes to get to your accommodation from the airport will depend on whether or not you book a private taxi or join others on a shuttle transfers. A private transfers can obviously take you straight to the door of your accommodation, whereas a shuttle bus may have to make several stops before arriving at your holiday resort and accommodation. The price for Faro Airport Transfers can therefore vary depending on what type of transport you decide on, with the shuttles generally being cheaper. If you are travelling in a larger group or you want a private taxi, it is advisable to book in advance to save money. There is a bus stop just outside the Faro Airport Terminal building that calls at the train station and bus station in Faro for onward travel. The journey time is about 15 minutes and costs less than 2€. If you are looking to travel to your resort by bus from Faro, Eva Transports is the main bus company in the Algarve and you can look at times of services on their website Eva Bus or call (00351) 289 899 700 for information. The train line runs along the Algarve from Vila Real de Santo António at the Spanish border to Lagos in the western Algarve. It is punctual, clean and cheap and the leisurely scenic trip will be enjoyed by all! The Portuguese rail service is called Comboios de Portugal (CP) and you can get prices and timetables or call (00351) 289 803 090 for information. There is a taxi rank at the arrivals end of the Faro Airport Terminal building with fares to all main tourist destinations published . Both 4 and 6-seater taxis are available. 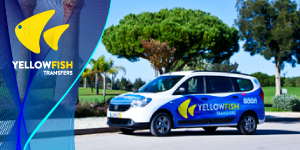 Taxis at Faro Airport can be pre-booked by calling (+351) 289 827 203; it is worth pre-booking for arrivals at peak times, particularly in summer, to save waiting. It is wise just to check the price with the taxi driver first and be aware that if you are travelling at night you may incur supplementary charges (an increase of up to 20%) between 22:00 and 06:00; this can also apply at weekends. On leaving Faro Airport car park turn right, then go round the right hand bend onto the main airport road, signed A22 (blue motorway sign). Follow dual carriageway signed A22 Portimão, passing the car hire return garages on your left. ATM's - (Multibanco machines) are available in Arrivals, Boarding lounge and in the public area. Exchange Bureau - in the public area of Arrivals. Open from 05.00 to 24.00 daily. Tourist information office - in the public area of Faro Airport Arrivals. Open from 08.00 to 23.00. Bars and Restaurants - Self-service restaurants, cafes and bars in both the boarding lounge and public areas as well as vending machines in both areas. Shops - In the public area there is a newsagents, gift shop, sweet shop and Vodafone shop. In the boarding lounge there are fashion and accessory shops, sunglasses, newsagents, leather goods, gifts and of course, the duty free area. Facilities for Disabled Travelers - There are toilet facilities and lifts for disabled passengers.